Christine Townend founded Animal Liberation Australia in 1976 after reading Peter Singer’s book Animal Liberation. 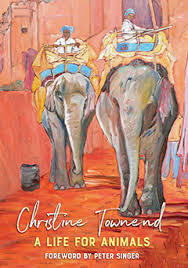 A Life for Animals is Christine’s memoir of her life’s work for animals first in Australia and then in India. Christine’s lifework for animals is a heroic and pioneering effort. It’s told honestly with Christine’s writing taking the reader along with you on her journey. And what a journey! She doesn’t hesitate to talk about the intransigence of some people who profit from animal cruelty and oppose any reforms. There are the health issues that challenge her in India and the attack by a Tibetan mastiff and how she courageously coped with these situations. And many more adventures and accomplishments. This is an inspiring read that demonstrates well how one person can make such a difference to the lives of all animals regardless of species wherever they live.